Six decades after her service in World War II, Gloria Heath ’43 is among the women pilots honored with the Congressional Gold Medal. 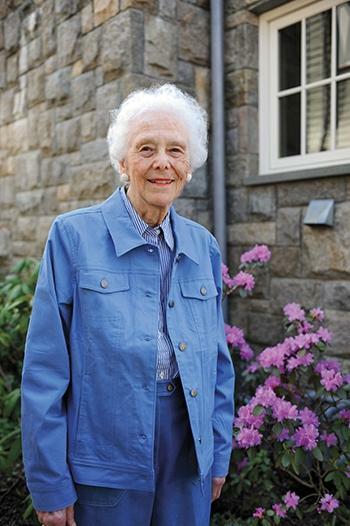 Frequent fliers take note: The next time you get on an airplane, consider giving a nod to Gloria Heath ’43, a pioneer in flight safety whose work, according to a report by the National Oceanic and Atmospheric Administration, has contributed to saving tens of thousands of lives. Throughout the 1950s and 1960s, as commercial air travel shot up and more planes filled the skies, Heath pushed for important advances in aviation and aeronautical safety. The result: Pilots were required to file flight plans, and locator beacons were installed on planes so they could be found in an emergency. Later, she pioneered the use of acoustic beacons to locate aircraft flight data recorders and cockpit voice recorders underwater, and she introduced the idea of using space satellites to help bring rescue crews swiftly to natural disaster sites on earth. Given her flair for derring-do as a student, her Smith contemporaries may be surprised that safety became the hallmark of her career. 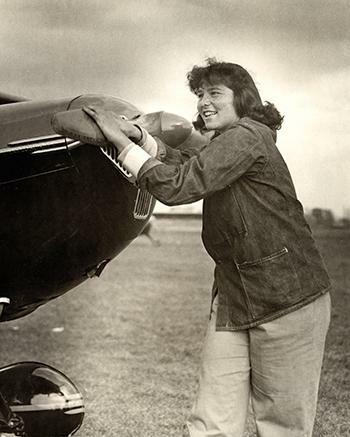 After all, this is the same Gloria Heath who thrilled the campus when, in high winds on a blustery day in 1941, she piloted the maiden flight of Bird of Paradise, circled around and dipped her wings as a tribute to the Smith Flying Club’s new plane. Heath’s flying career took off at Smith and continued to soar after graduation as the war beckoned to experienced pilots. As a World War II WASP [Women Airforce Service Pilots] Heath was among the first American women to be trained to fly military aircraft, performing vital stateside missions that allowed male pilots to serve overseas. Recognition, though, came more than six decades later. Last July, she and her sister WASPs, including several other alumnae (see sidebar), were awarded the Congressional Gold Medal, the highest civilian award given by Congress. For Heath, the medal caps a career filled with accolades, including being named one of the 100 most influential women in aviation, receiving the President’s Citation for Outstanding Achievement in Safety Leadership from the Flight Safety Foundation, receiving a Lifetime Achievement Award from the Women in Aerospace, and being inducted into the Women in Aviation Pioneer Hall of Fame. In photographs from her career, Heath is easy to spot; she has an elegant stature and an easy smile—and she’s usually the only woman in a group of men. In a photo from a Flight Safety Foundation event in the 1980s, for instance, Heath in a white blouse and long skirt, stands out among some two dozen colleagues, all dressed in somber suits and ties in shades of gray and black. As a WASP, not surprisingly, Heath was the only woman in a squadron of male pilots at Grissom Air Force Base in Indiana. She flew B-26 bombers, towing a target in her wake, at which fighter pilots would shoot live ammunition. Being the only woman has never been particularly important to Heath, nor does she spend much time thinking about whether women faced a rough road in those decades before women’s liberation burst onto the cultural landscape. Yes, she says, she is aware that there was a great deal of prejudice against women, but it didn’t hold her back. She does acknowledge, however, that the Congressional Medal of Honor comes after a history of injustice. When the war was over, women pilots—who as WASPs were technically civil service employees—were decommissioned, a euphemism, Heath observes, for being kicked out to make way for men returning from battle. One WASP history reports that decommissioned women pilots even had to pay their own way home. The unceremonious termination of their service meant, significantly, that the women pilots were not entitled to military benefits. Those benefits were eventually reinstated—but not until some thirty years later. Still, it’s hard to deny the unfairness. For instance, despite her position as a leader in the aviation safety field, Heath was not admitted to the Wings Club, an influential and fast-growing organization in the years after World War II, because membership was open to men only. So while her male colleagues at the Flight Safety Foundation, then based in New York City, filed past to attend their monthly club luncheons, Heath gobbled down a tuna sandwich, alone in her cubicle. Once, she recalls, when she was invited to address members of the Wings Club about flight safety, despite not being eligible for membership herself, the chief engineer advised her to preface her remarks with “As you already know . . .” in order to placate the men’s egos. “She certainly had what it takes to work and survive in a man’s world,” said Commander Patricia Beckman, a past president of Women Military Aviators and a founding board member of Women in Aviation International, the organization that inducted Heath into the Pioneer Hall of Fame in 1999. “She was not only a role model that people look up to, she was also someone who would help women along who wanted to follow in her footsteps,” Beckman said. His unconventional thinking showed up in the Long Island home where Heath and her brother, also named Royal, grew up. Heath’s father kept a greenhouse where he grew lilies and kept goldfish, as well as a small pet alligator. Later, Heath’s independent spirit was nurtured at the Putney School in Vermont, where students were encouraged to take responsibility for their own learning, and at Smith. On paper, Heath’s Smith major was in education and child studies, but she jokes that her real major was extracurricular activities. She wrote for SCAN (Smith College Associated News), the school newspaper, and was a leader on the lacrosse team, eventually becoming a member of the National Women’s Lacrosse Team. And, significantly, she was president of the Smith Flying Club. Heath was only 4 years old when she first climbed into a plane. A barnstormer had landed in a small field near her home and her father wanted his children to experience the wonder of flight. The plane had only two passenger seats so Heath’s father took one, and Gloria and her brother squeezed into the other. “I don’t think I looked out over the edge! I was just glad to get down,” Heath remembers. She truly fell in love with flying, though, when she was at Smith. During spring break of her first year her brother Royal, less than two years her senior, took her up in a plane when she went to visit him at Stevens Institute of Technology in New Jersey, where he was in a civil pilot training program. As soon as she got back to campus Heath joined the Smith Flying Club. At the time members contented themselves with talking about aviation, but Heath convinced the fifteen student members to contribute $100 each to buy a Taylorcraft plane that they painted black, embellished with the Smith colors of purple, yellow, green, and red, and dubbed Bird of Paradise. (In retrospect, Heath winces at the choice of colors. “Black is the worst color for safety,” she notes.) With their remaining funds, the students hired a flying instructor at $3 per hour. Heath fondly remembers bicycling the five miles from Smith to the now defunct LaFleur airfield for flying lessons. Soaring above the farms, rooftops, and spires of the Pioneer Valley her worries about grades and schoolwork shrank into their proper perspective. “We saw aviation as bringing the world together for peace,” Heath said of the Flying Club. “You couldn’t have contact without aviation.” Once the people of the world had easy access to one another, the youthful Heath reasoned, surely they would learn to love one another. When the war ended in 1945, Heath and her brother Royal flew to South Carolina where they each purchased a surplus military plane for about $350, hopped in and flew home. But her stint as a recreational pilot was short-lived. When she and Royal presented their new planes to their father, he asked how they intended to pay for fuel and insurance. Heath answered cheekily, “We won’t insure them!” But his point was well taken, and soon enough she agreed that the plane was too expensive and sold it. As for her brother, Royal, after returning from the China Burma Theater as a decorated veteran and becoming a flying instructor, he died in 1948 piloting a plane during what Heath describes as “a freak confluence of two storms over Baltimore.” He was 28 years old. By then, Heath had already begun working in the field of flight safety. “People say, ‘Wasn’t that ironic,’” she said, about her choice of careers. But, she insists, “It wasn’t related.” Sixty years later she still stumbles on words as she tries to describe the effect of her beloved brother’s death on her and her parents. The end of the war and the acceleration of commercial air travel brought new opportunities to Heath, who saw a growing need for safety standards. Even as planes were crisscrossing the globe, international standards had not yet been set for the most basic activities, such as a common language for aviators and whether height would be measured in meters or feet. The insurance industry recognized the problem, and in 1945 Heath took a job as an air insurance underwriter. Then in 1946, she approached Jerome Lederer, who became the director of the Flight Safety Foundation, to find what role she could play in improving air safety. A year later she became the first employee of the Flight Safety Foundation, a newly formed nonprofit whose membership now spans 150 countries and includes representation from more than 1,200 organizations. After working for more than two decades in flight safety, Heath’s career changed orbits when she was asked to head up the International Academy of Astronautics Space Safety Committee. At the time there were no protocols in place for responding to astronauts or cosmonauts who were stranded in space or who had to make emergency re-entries into Earth’s atmosphere. In studying what was needed and who could assist in an emergency landing on Earth, she realized the same flight-safety strategies were needed. However, the idea of using resources earmarked for space travel for earthbound disasters instead was unheard of. “When I introduced that idea, I got quite chewed out for it,” she said. “But it didn’t deter me. I saw that this was the future of space: benefiting mankind.” And in 1982 the worldwide system Heath argued for, which would use responders in satellites to receive distress signals from Earth, was put in place. Heath, always modest and methodical, may not have set out to break glass ceilings or open new doors, but still, she did gain entry to worlds not previously inhabited by women. Even the doors to the Wings Club eventually opened to her.